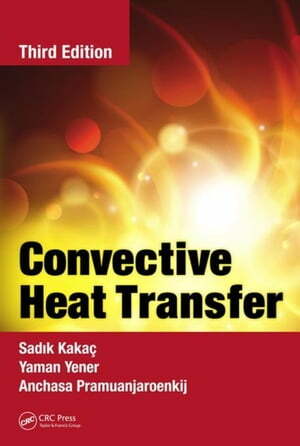 Collins Booksellers - Convective Heat Transfer, Third Edition by Kakac, Sadik, 9781466583474. Buy this book online. Intended for readers who have taken a basic heat transfer course and have a basic knowledge of thermodynamics, heat transfer, fluid mechanics, and differential equations, Convective Heat Transfer, Third Edition provides an overview of phenomenological convective heat transfer. This book combines applications of engineering with the basic concepts of convection. It offers a clear and balanced presentation of essential topics using both traditional and numerical methods. The text addresses emerging science and technology matters, and highlights biomedical applications and energy technologies. The third edition details the new research areas of heat transfer in microchannels and the enhancement of convective heat transfer with nanofluids. The text includes the physical mechanisms of convective heat transfer phenomena, exact or approximate solution methods, and solutions under various conditions, as well as the derivation of the basic equations of convective heat transfer and their solutions. A complete solutions manual and figure slides are also available for adopting professors. Convective Heat Transfer, Third Edition is an ideal reference for advanced research or coursework in heat transfer, and as a textbook for senior/graduate students majoring in mechanical engineering and relevant engineering courses.